IEC 61439 'Low-voltage switchgear and controlgear assemblies', specifies standard arrangements of switchboard (call forms of internal separation). The are labelled as Form 1, Form 2, Form 3 and Form 4. Forms 2, 3 and 4 are further broken down into Form 2a, 2b, 3a, 3b, 4a and 4b. Internal separation is achieved by the use of barriers or partitions (including metallic or non-metallic), insulation of live parts or an integral housing (i.e. moulded case circuit breaker). The internal barriers should provide protection against contact to IP XXB and against the ingress of foreign bodies to at least IP 2X. Forms of separation Form 1 - no internal separation of the busbars, functional units and terminals from each other. Form 2a - separation of the busbars from the functional units. Terminals are not separated from the busbars. Form 2b - as for 2a, but with the terminals are not separated from the functional units. 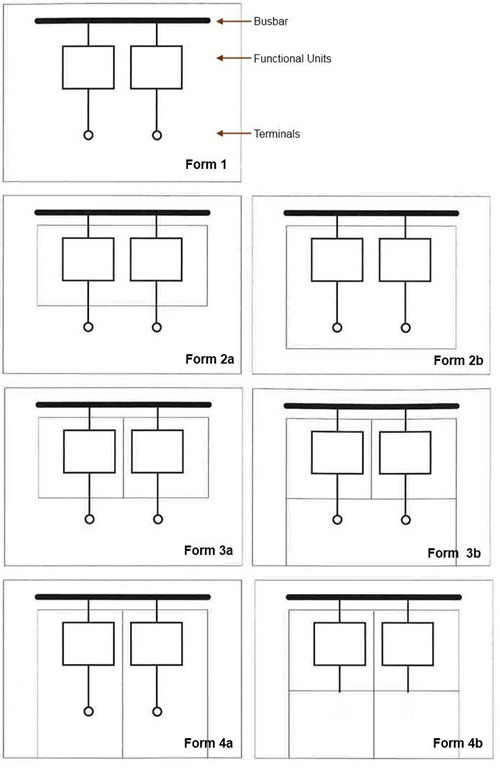 Form 3a - separation of the busbars from the functional units and each functional unit from the other units. Terminals of each functional unit are not separated from each other. Terminals are not separate from the busbars. 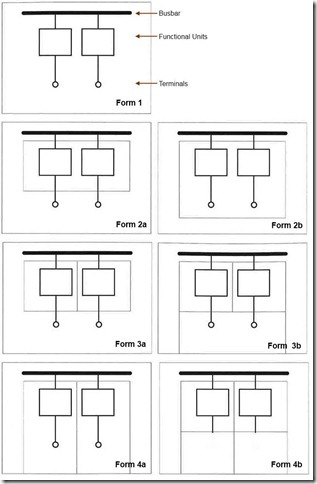 Form 4a - separation of the busbars from the functional units and each functional unit from the other units. Separation of the terminals for a functional unit from the busbars and those of any other unit. Terminals enclosed in the same compartment as the functional unit. Form 4b - as per 4a, but with the terminals for each functional unit enclosed in their own space. The United Kingdom implementation of the IEC standard (in BS EN 61439-2) further defines the separation of busbars and cables by the use of Types. These have been widely adopted within and outside the United Kingdom. You may also be interested in the related post IEC 61439 Verification Methods. Please describe "type testing" of switchboards and how it is done and guidelines,codes,requirements(test voltage,leakage current etc) of a good switchboard etc. Should the testing be done before making the complete switchboard including or afterwards?. Thanks for the comment. If you need a quick answer, testing of switchboard assemblies is fully detailed in the IEC 61439 standard. If you can wait a bit, I have added this to my lists of future posts and will get round to writing a post on it at some stage. What about types – Form 4B Type 5 for example? Peter, thanks for the question. Types are not part of the IEC standard, but are specific to the British (BS EN standard). BS EN 61439 (and most other BS EN standards) are copies of the same numbered IEC standard, with a National Annex at the back. The National Annex lists deviations/additions to the IEC standard which are specifically applicable to the UK. The National Annex for BS EN 61439 details with Types of switchboard. For your example the Form 4b Type 5 is listed as requiring ‘Busbar separation is by metallic or nonmetallic rigid barriers or partitions. Terminals may be separated by insulated coverings and glanded in common cabling chamber(s)’. For the other types associated with each form, you need to look at the standard. Thanks for the quick reply Steven. All clear. Form 4 Type 7 as shown on the guides is misleading I feel in some respects. Whilst the requirement is to gland at the outgoing unit it is often difficult to terminate large armoured cables at this point in a board. In my opinion it is still satisfactory to gland the armouring in a SWA gland at the roof or floor and continue to the inner box where a Pg gland can be fitted. This allows for easier glanding of heavy cables and prevent ingress to the board of small creatures which could pass through IP2x gaps in the cable compartment. However I have met clients who refuse to accept such a solution. Type 7 is from the national annex for the UK implementation of the IEC standard and requires integral glanding in for each termination. Types 1 to 6 are more open and probably do accommodate the scenario you are presenting. The specification of type is by the electrical designers. Why engineers choose Type 7 could be different – maybe they have some technical requirement, it could be a requirement from a local authority, just something they have always done or maybe just because it is the most stringent. From my experience, I ‘m not sure how often people really consider the selection of most appropriate Form and Type. Ideally we should be looking at the technical performance, cost, practicalities of installation, operational and maintenance requirements, etc. – the correct selection is something of a trade off.